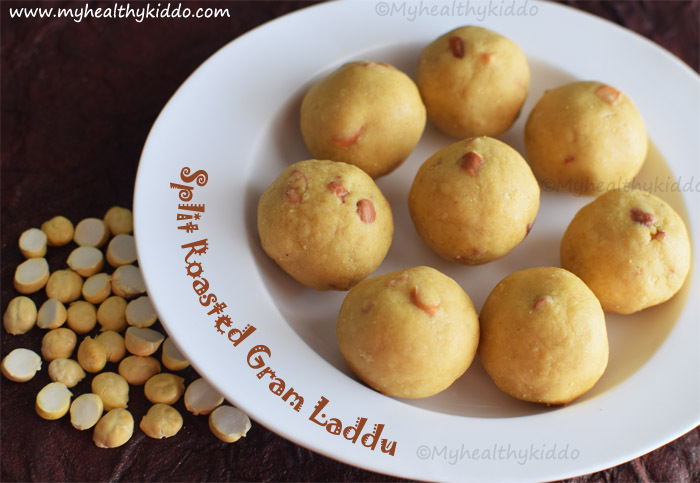 Pottukadalai ladoo/Fried chana dal laddoo is a protein packed sweet ball. Jaggery adds extra minerals to the balls. Pottukadalai ladoo using jaggery following this recipe will taste great and similar to the one you make with unhealthy sugar. When there is no compromise in taste, then why don’t you choose healthy option ?! 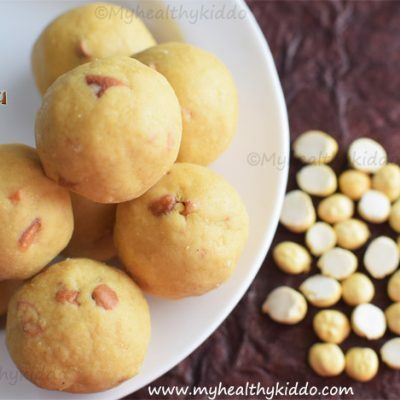 Try this fool-proof pottukadalai ladoo recipe and treat your kids. Diwali is nearing and do make this Diwali more healthier. Pick your favorite from my healthy Ladoo(Click) collection. Follow me in Facebook / Google+ / Twitter / Instagram for more healthy recipes. Add filtered jaggery syrup to a pan and let it boil well. Take a plate, grease it with ghee and keep ready. In a bowl of water, add few drops to check the consistency of syrup. You should be able to gather the drops to a mass and roll it into a soft ball. If the above consistency is reached, simmer and add ½ cup fried chana dal to the syrup. Mix well so that all syrup are coated well. Transfer the contents to the greased plate. Remove the grams stuck to the ladle with a spoon. Spread and try to break any long bunches. Once cooled, immediately transfer to mixer in batches and grind it to smooth powder. In a hot pan, add ¼ cup ghee and once melted, add broken cashew pieces. Switch off once cashews slightly change brown. Pour ghee & fried cashews, mix well with your hand or a spoon. Take some and just press with your palms by changing ladoo position for every press to make it round. Once cooled, store in air-tight container and enjoy for a week. 1.Do not worry, if jaggery consistency crosses soft ball and enters hard ball. Just break the bunches while cooling down so that grinding is easy. 2.If you are not bothered about filtering the impurities in jaggery, then use grated jaggery and directly grind along with plain pottukadalai. In such case, you shall just start from step 7. 3.If you want to skip cashews, just melt ghee and add. 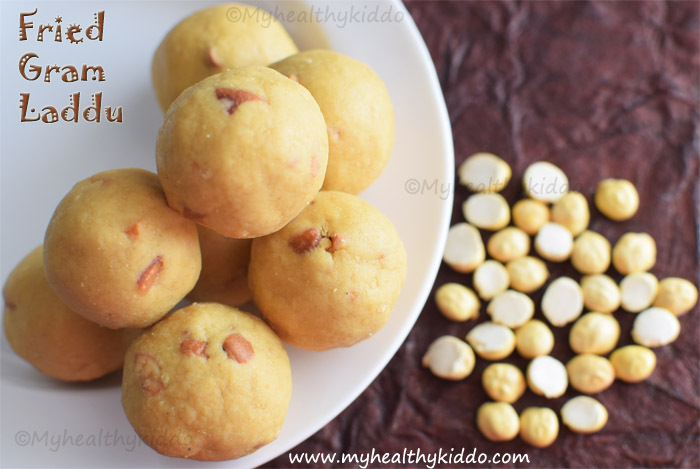 Preparation – How to make pottukadalai ladoo with jaggery ? 1.Take 1/3 cup of grated jaggery. Add 1/3 cup water and a generous pinch of cardamom powder. 2.Let it boil so that jaggery dissolves completely. Strain the syrup for impurities. 3.Add filtered jaggery syrup to a pan and let it boil well. Take a plate, grease it with ghee and keep ready. 4.In a bowl of water, add few drops to check the consistency of syrup. You should be able to gather the drops to a mass and roll it into a soft ball. 5. If the above consistency is reached, simmer and add 1/2 cup pottukadalai to the syrup. Mix well so that all syrup are coated well. 6.Transfer the contents to the greased plate. Remove the grams stuck to the ladle with a spoon. Spread and try to break any long bunches. 7.Once cooled, immediately transfer to mixer in batches and grind it to smooth powder. 8.In a hot pan, add 1/4 cup ghee and once melted, add broken cashew pieces. Switch off once cashews slightly change brown. 9.Pour ghee & fried cashews, mix well with your hand or a spoon. 10. Take some and just press with your palms by changing ladoo position for every press to make it round. Once cooled, store in air-tight container. 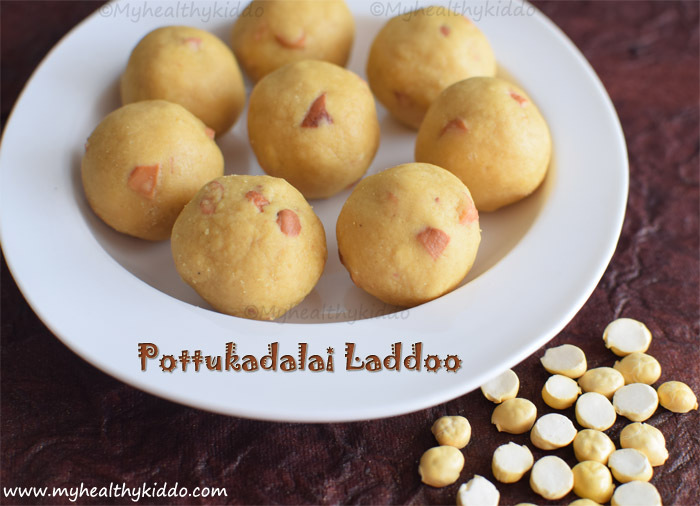 Enjoy tasty and healthy pottukadalai ladoo.. If you have sweet tooth, add jaggery equal to chutney dal/pottukadalai. Do not worry, if jaggery consistency crosses soft ball and enters hard ball. Just break the bunches while cooling down so that grinding is easy. If you are not bothered about filtering the impurities in jaggery, then use grated jaggery and directly grind along with plain pottukadalai. In such case, you shall just start from step 7. If you want to skip cashews, just melt ghee and add.